So, so true! This is awesome 🙂 I passed it along to my partner… and at last she understands! I was looking for the place this comic came from for a while! I’m happy I found it. Mind if I use it to illustrate an example on a post I’m writing on my blog? Thank you Erin – I used your post to explain to my mother why I got so aggro about being interrupted as a child, and she was actually able to understand! I have grappled my entire life with shame over my deficiencies, but the increase in conversations and awareness about autism helped me to realise that these are all classic aspects of high-functioning autism, and that I’m not alone in how I experience the world. Erin, thank you so much for having drawn and posted it! I’m 50 y.o. in a southamerican country, discovering I’m in the spectrum, discovering we’re still in “baby diapers” about autism and Aspergers health resources and even professional understanding, and this may be one of the best graphic explanations of why I “think” and “behave” the way I do. Any chance you can translate it into Spanish? Erin, thank you for this cartoon. I’m a computer engineer and someone posted it to our group chat this morning. It resonated with the whole team and I wanted to echo that back to you with our appreciation. I’ve found that many of the more successful individuals in this field are on the spectrum. Usually very highly functioning, but definitely sharing tendencies. Maybe that’s why our team was so captivated by your piece. I love that story Stephen, thank you! I can definitely see how the ability to hyper-focus would be an asset to computer engineers. Glad the cartoon was useful to your team! Hi Erin, what a wonderfully clear way of putting it. I wondered if I could use it on a blog post, credit to you, of course, on our website: http://www.unlocking-learning.co.uk. Dear Erin. Thank you for this invaluable visual explanation into something that I had a hard time to understand working with my students that are on the spectrum. I knew what my student were going through, but they were not able to explain the feeling. I hope it’s okay to shared this with my team so we can use it during our autism awareness week next week. I will make sure to give credit to your work. I am undertaking a 2 year post grad degree in specialised teaching:learning and behaviour. 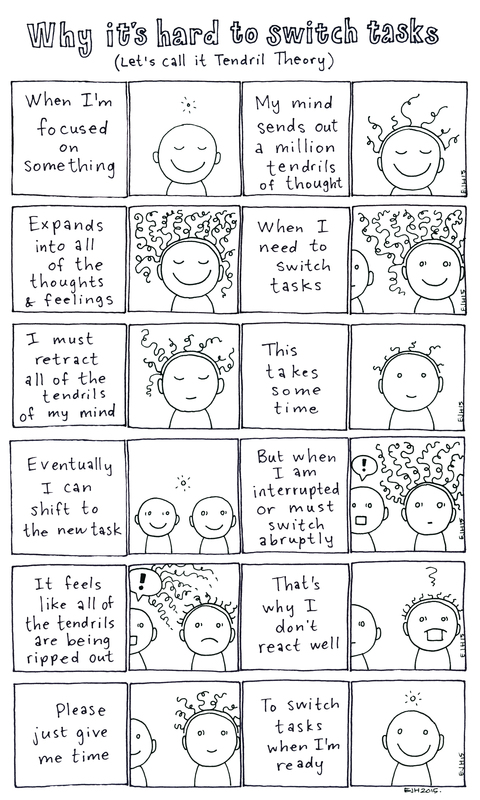 I was so impressed with the tendril theory that I wanted to share it with my fellow studiers especially those who work with students on the spectrum. If I reference it to you and your blog would it be ok to share it please? Thanks Erin. Many other professionals such as early intervention teachers, resource teachers vision and deaf, special needs teacher now have access to your blog! Dear Erin, I am a mother of a 4 yo girl with Prader-Willi syndrome and some autistic behaviors. We live in Brazil. Do you mind if I use the drwaings and translate the text into Portuguese? This will be great to illustrate the switching tasks difficulty to our community here. With all the credit tou you, of course. Yes, that would be great! If you want to send me a link or file when it’s finished, I could share it too. Thanks! Of course I will share! Thank you so much! I just posted The Tendril Theory translated into Portuguese in the Brazilian Association of Prader-willi Syndrome page on Facebook. Thank you again for authorizing it! Please, feel free to share it too.